Typically made from Western Red Cedar and Yellow Cedar, wood shakes and shingles are applied over spaced sheathing and felt, allowing them to breathe naturally without requiring additional ventilation. Wood Shakes - Hand-split wood shakes reveal the uneven, natural grain of the wood. The most common lengths are 18” and 24”, and the thickness is known as medium or heavy. 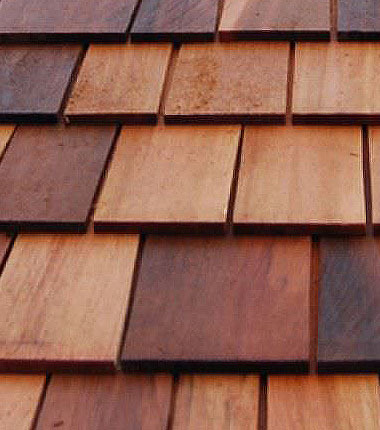 Wood Shingles - Machine-sawn wood shingles are thinner than shakes, are tapered and sawn on both faces for a more uniform appearance. The most common lengths are 16” (Five X), 18” (Perfections), and 24” (Royals). They come in different grades, which are determined by the quality and chance of warping over time. The grades are known as No. 1 Grade Blue Label, No. 2 Grade Red Label, No. 3 Grade Black Label, and No. 4 Grade Green Label. The best of the grades is No. 1 Blue Label. The Grade determines the quality and chances of warping over time. Wood shakes and shingles can also be fire-treated, yet the fire-resistant capabilities usually wear off after 5 years due to weathering and sun exposure. Check with your insurance carrier to determine whether there is a discount on your premium for fire-resistant roofing. You can request a custom quote for your roof repair or replacement.